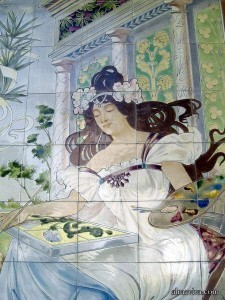 The Paris-based Almaviva tile studio offers replicas of Art Nouveau ceramic tiles and murals. These panels are made using traditional ceramic techniques employed around 1900: cloisonné technique, also called “cuerda seca“, or tubeline relief. You can see examples of such Art Nouveau friezes and ceramic panels in our Montparnasse showroom in the centre of Paris. Art Nouveau is an art movement that flourished in Europe between 1892 and 1914. It is characterized by the use of arabesques and curves inspired by the plant world. Depending on the country, Art Nouveau received several denominations. In France, it is sometimes called “noodle style” or “metro style” with reference to Parisian subway entrances made in 1900 by Hector Guimard. The French term “Art Nouveau” is also used in England. In Germany, this artistic movement is called Jugendstil, in Austria Sezessionstil, in Italy Stile Liberty, and in Spain Modernismo. Around 1920, Art Nouveau yields to Art Deco, and straight lines replace the curved lines. 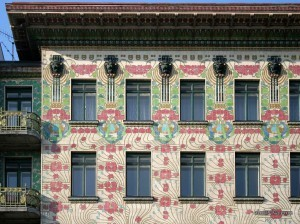 Art Nouveau is reflected in all registers of creation: painting, posters, objects, furniture, jewelry, architecture, etc. In architecture, ceramics is very present, both on façades and in interiors. The façades are often decorated with glazed stoneware tiles. 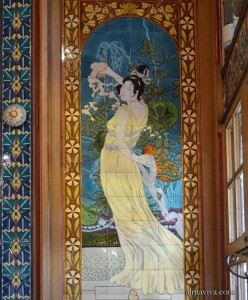 Ceramic panels Art Nouveau also decorate the interior of restaurants or pubs, or lobbies of buildings. At the 1900 World’s Fair held in Paris, much emphasis is placed on Art Nouveau ceramic. At the entrance of the Alexander III bridge, on the Esplanade des Invalides, a vast palace of stucco, called French Manufactures Pavilion, presents a profusion of ceramic sculptures and friezes along a path that went from the Seine to the Invalides. 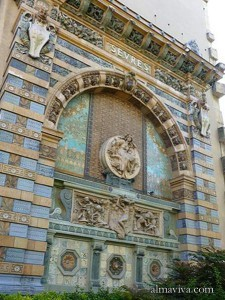 Midway was built the Porte de Sèvres, a monumental gate covered with bas-reliefs in ceramics. This gate has been preserved and is now on the Boulevard Saint-Germain, just behind the church of Saint-Germain-des-Prés. In the centre of the door, is a sculpture of a woman in Art Nouveau style representing the art of ceramic. A frieze in bas-relief is depicting the art of pottery.